Wanna have some fun? Set Paul Cayard loose on the subject of America’s Cup 34, some re-imagined and surprising wing-control mechanisms, and the terrors of San Francisco Bay in full cry. The custom AC72 catamarans of 2013, he says, will be 30 percent more powerful but “much less stable” than the AC45s that sailed three events this year on the America’s Cup World Series circuit. And occasionally failed to maintain verticality. Cayard’s home waters, where the Cup will be sailed, are known to be a windy spot, and when the ebb tide works against the seabreeze—one sixth of all the water in San Francisco Bay goes out, and in, twice a day—then she be lumpy, mon. Sea state, even more than wind strength, is something to fear once the breeze is up, funneling through the Golden Gate and peaking on many days at 18-22 knots. Unless it peaks at 30, and shucks, that’s just home for the home folks. But what does it mean to racing an AC72 with 38 hydraulic cylinders in the wing? The Artemis approach to efficiency, Cayard says, uses a three-element wing. No surprise. Any wing is much more efficient than a mast and soft sail—for many reasons, not the least of which is that mid-leech tension becomes a non-issue—and C Class catamarans long ago demonstrated that three elements are faster than two. I expect every AC72 to have a three-element wing. Unless, or until, someone develops a fully-warpable single-element wing, but that’s for another day . . . In C cats, the middle element has been narrow, which probably is a portent for AC72 wings, but what do I know? There’s never before been as much money or as much research thrown at the problem as now. 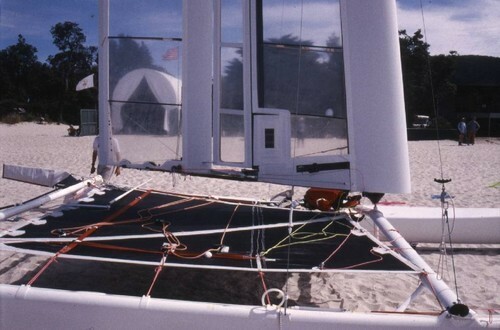 Richard Gladwell shot this pic of a three-element wing on 1996 Little America’s Cup winner Cogito . . . But when you scale up to a wing 130 feet tall, how do you control the beast? The first Artemis wing is under construction in a special facility in Valencia, Spain, Cayard says, and to control the moving parts in that wing, “We have 38 hydraulic cylinders. We want to avoid running hydraulic piping to each of them, because that would be heavy, so we have electrovalves embedded in the wing to actuate the hydraulics. But if you had two wires, positive and negative, running to each electrovalve, your wing would look like a PG&E substation, and that’s heavy too, so we use a CAN-bus [controlled area network] with far fewer wires. Still, it’s incredibly complex. And how will this Artemis wing fit into the fleet to be? The fleet of which we know almost nothing . . .
“Once you have a setup like ours you could easily autopilot the thing,” Cayard says, “but that’s not legal. You must manually control the wing, with no stored power. With our guys grinding to maintain hydraulic pressure, someone else on the boat can push a button and send an electric current to a switch that will open a valve to let hydraulic fluid flow to shape the wing. Footnote: The one-design AC45s now on hiatus until America’s Cup World Series racing resumes in April in Naples, Italy, were purposely kept simple because the game needed boats on the water, and the engineers needed to get it right the first time. Thus the two-element wing. Thus the straight daggerboards. The design team got it right, and the boat is a winner. But no one is going to bring that package, upsized, to the gunfight of 2013. Postscript: Congress today approved the America’s Cup Act of 2011, guiding the AC around any trip-ups under the Jones Act. A bit late for the San Diego ACWS, but what else is new. You can read the whole deal right here if you’re into that sort of thing.